An eelgrass bed in Puget Sound. Photo courtesy of Oregon State University. Seagrass environments are rich in life and are often seen as a buffer against global warming because they take up carbon dioxide (CO2) during photosynthesis. This is largely true in the summer when the grasses are growing and thriving during the longer, sunny days. But there’s a cost. The plants as well as the many creatures living in the habitat also respire CO2 — just as humans do when we breathe out — releasing carbon into the water, especially at night and during the winter months. The paper’s authors call this cycle “carbonate weather” because it leads to relatively rapid local changes in carbon across the time of day and the season. Normally, they say, the environment is able to withstand this natural process, but human-caused CO2 from the atmosphere is starting to tip the balance. The projected rise of CO2 in seagrass environments is about double the projected rate of change in the open ocean, according to the study, indicating that these habitats and estuaries in general may be especially sensitive to ocean acidification. Oregon State University (OSU) doctoral student Stephen Pacella and his colleagues at OSU and the Environmental Protection Agency, modeled seasonal carbon levels from 1765-2100 using historical data and data collected from their study site, eelgrass habitat at the mouth of the Snohomish River in Washington. In each scenario, they found that winter had more carbon and greater acidity than summer, and that this seasonal difference dramatically increased with time. While the present scenario showed only a 60-70% difference in acidity from winter to summer, the future scenario predicts a 200-300% difference between seasons, which could harm some species. Speaking at the 2018 Salish Sea Ecosystem Conference in Seattle last April, Pacella used Dungeness crabs (Cancer magister) as an example. In their larval stages, Dungeness crabs in laboratory environments die more often when exposed to pH (acidity) levels below 7.5. Pacella’s models predict that by the year 2050, the winter levels will go below 7.5 and into dangerous territory for the crabs. This result is alarming because the Dungeness larval phase occurs during the winter months, which coincides with the period of highest acidity in the water. Pacella emphasized that the model alone does not indicate larval crab die-offs under natural conditions, but he said understanding seasonal patterns and fluctuations in ocean acidification will be crucial to gauging organismal and ecosystem impacts. Despite the concern over the rapid acidification in seagrass habitats in the short term, the study's authors say seagrass could eventually serve as a buffer against acidification in some cases as CO2 increases in the atmosphere. 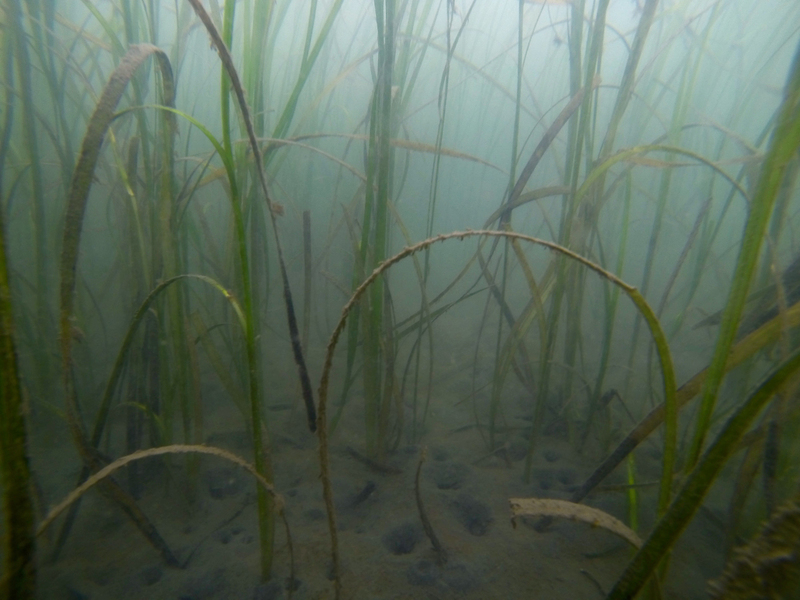 "Seagrass habitat metabolism drives these short-term extreme events, yet ultimately reduces organismal exposure to harmful conditions in future high-CO2 scenarios," according to the paper. By 2060, atmospheric CO2 is expected to reach levels high enough that seagrass — despite its tendency toward acidity — will actually offset some of the effects of nighttime CO2 conditions. In the meantime, seasonal fluctuations in CO2 may not just be isolated to local seagrass beds. Another study published earlier this year in the journal Elementa showed similar shifts in the carbon balance across Puget Sound. Elementa reports that the Washington Department of Ecology sampled monthly surface water conditions at six different locations across Puget Sound from 2014 – 2015 and found higher amounts of carbon and greater acidity between the months of October and March. Alex Stote is a graduate student in the School of Marine and Environmental Affairs at the University of Washington. Jeff Rice is the managing editor of the Encyclopedia of Puget Sound.